A comparison of pharmaceutical wastewater treatment between China and the other countries was carried out based on the bibliometric analysis, which analyzed the research output through the Science Citation Index Expanded from the Web of Science. This study will provide insights into research activities of China and the other countries during 1990 and 2013 in the field of pharmaceutical wastewater treatment. The performance of publication covering annual outputs, the contribution of different countries, research tendencies and hotspots was studied. The results indicated that the annual output of the related scientific articles from China increased steadily together with the world. Water Research, Chemosphere, Water Science and Technology, Environmental Science & Technology, and Science of the Total Environment were the five most common journals in pharmaceutical wastewater treatment research. The United States of American (USA) took a leading position in the world, followed by China, Spain and Germany. The extraction, biological treatment, ozonation, adsorption, filtration, photo-catalysis, Fenton, coagulation technologies were found to be current research emphases, based on the analysis of paper title, author keyword and KeyWords Plus. Pharmaceutical industry has been one of the most important industries in the world. Their different therapeutic classes are consumed in large number annually around the world to prevent, diagnose, mitigate or cure diseases in humans as well as animals [1-3]. With the economic development and population growth, China has been the largest raw medicine production and export country in the world since 2009. Till now, China is a large country with huge amounts of production and consumption of pharmaceuticals. In pharmacy production process, several or dozens of steps are needed to produce products with a large quantity of raw materials. The raw material consumption rate was about 10 kg per kg medicine production, even 200 kg per kg medicine production. Thus pharmaceutical industry became a heavy polluted industry with production of a large quantity of wastewater containing complex pollutants . In China, the GDP from pharmaceutical industry accounts for 1.7% of Chinese total industrial production. However, the wastewater produced from pharmaceutical industry is 2% of total wastewater quantity . In recent years, many studies have demonstrated the widespread occurrence of pharmaceuticals in drinking water and water environment [6-8]. Increasing concern has been raised on the potential risk to environment and human health [9-13]. It is necessary to stringently control pharmaceuticals in wastewater before it was discharged into water-body. To effectively control the pollution caused by pharmaceuticals in wastewater, many studies has been conducted on the physical-chemical technologies such as advanced oxidation processes (ozonation, photolysis and heterogeneous photolysis, Fenton and photo-Fenton, sonolysis, electrochemical oxidation, etc. ), activated carbon adsorption, and membrane separation [14-20]. Biological treatment (aerobic and anaerobic treatment) as well as the hybrid process composed of physical-chemical and biological technology was also the hot topics of the research [21-33]. For decades, pharmaceutical wastewater treatment related research has become a multidisciplinary field which covers a wide spectrum including studies on environmental engineering [34-39], environmental sciences [40,41], biotechnology and microbiology [42,43] and medicine research . Today, the effective technologies for the pollution control are still under debate. Bibliometrics is a research tool mainly applied in library and information sciences which could be used to map the literature around a research field. In this methodology, the quantitative analysis and statistics was used to describe distribution patterns of publications within a given topic, field, institute or country [45-48]. Generally, bibliometric research was conducted based on the Science Citation Index (SCI) that traces publications of the Institute for Scientific Information (ISI). This method has been applied in all kinds of research field [49-52]. Topics in the field of environmental science and engineering have also been studied using bibliometric methods [53-56]. For instance, drinking water related research during the past 20 years was analyzed to provide a basis for a better understanding of the global research situation, establishing medium and long term strategies of this field . An assumption has been made in these studies that the state of science could be reflected by the publications of a country and the number of publications is a reasonable indicator for the research and development efforts in that field [54,56-58]. In this study, pharmaceutical wastewater treatment related research from 1990 to 2013 was analyzed to better understand the similarities and differences between China and the worldwide. The comparison was made based on the annual outputs, the contribution from different country and research trends and hotspots. The bibliometric method applied in this study followed other studies [59,60]. Data of worldwide were extracted from the online version of SCI-Expanded databases of the Web of Science from Thomson Reuters on December 31, 2013. Data of China were extracted from the online version of China National Knowledge Infrastructure (CNKI). Citation analysis was based on Journal Citation Report (JCR) which indexed 8336 journals with citation references across 176 Web of Science categories in the science edition. “Wastewater OR effluent OR sewage OR discharge*”AND “pharmaceutical* OR medicine* OR drug OR hospital” AND “treat* OR remov*” were searched in terms of subject within the publication year limitation from 1990 to 2013. The citations related to pharmaceutical wastewater treatment were downloaded. In total, 2,798 Journal articles were used for further analysis Downloaded information included names of authors, contact address, title, year of publication, author keywords, KeyWords Plus, abstract, Web of science categories of the article, and names of journals publishing the articles. Impact factors (IF) were taken from the JCR published in 2013. The keywords for mainstream technology of pharmaceutical wastewater treatment were listed as follows: “extract*;activated sludge;ozone*;absorption;filter* NOT membrane; (photochem* OR catalyt*);Fenton;Aerator* NOT BAF;coagulation* ;(ultra* OR micro*) AND membrane filtration;(osmosis OR nano*) AND membrane filtration;ecology* R additives OR magnetic* ;Contact Oxidation;distillation*;ultrasonic;wet oxidation;ion exchange”. Articles originating from England, Scotland, Northern Ireland, and Wales were regarded as that from the United Kingdom (UK). Articles from Hong Kong were included in China. Contributions of different institutions and countries were estimated by the affiliation of at least one author to the publications. Collaboration type was determined by the addresses of the authors . To obtain an overview of pharmaceutical wastewater treatment research, the annual number of articles published worldwide and by China during 1990–2013 was displayed in Figure 1. The number of pharmaceutical wastewater treatment publications increased from 2 in 1990 to 419 in 2013 worldwide. 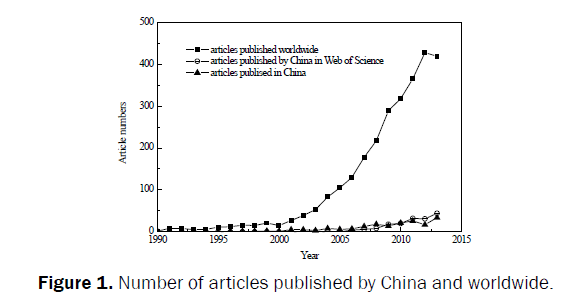 For China, the number of articles published in Web of Science increased from 0 in 1990 to 44 in 2013. In addition, the number of articles published in China increased from 2 in 1990 to 34 in 2013. The contribution of China to worldwide research publication of pharmaceutical wastewater treatment increased from 0 in 1990 to higher than 10%. It would increase to 17.2% if the articles published in China were counted. Figure 1: Number of articles published by China and worldwide. The development stages of pharmaceutical wastewater treatment research were reflected in Figure 1. The first stage for worldwide ranged from 1990 to 2001. In this stage, the publication increased slowly. From 2001 to 2009, the publication increased sharply with increasing rate from 21.9% to 80.0%. After 2009, the publication increasing rate went back to be lower than 17.3%. For China, the publication increased slowly before 2009 while it increased rapidly with average increasing rate of 47.6% after 2009. After 2009, China has been the largest crude drug export country in the world. A large quantity of pharmaceutical wastewater was produced in this process. Thus more and more researchers were focused on the research field of pharmaceutical wastewater treatment. The articles used for analysis were restrict in the categories of environmental science, biotechnology applied microbiology, engineering environmental, engineering civil and water resources. The category of engineering environmental contributed the most articles, followed by environmental science, engineering civil and water resources and biotechnology applied microbiology. Table 1 shows the top 10 productive journals, accounting for approximately 57% of the articles with impact factor (IF) ranged from 1.122 to 5.228. Water Research published the most articles with 319 articles (11.4%), while Chemosphere ranked second with 235 articles (8.4%), Water Science and & Technology ranked third with 232 articles (8.3%), Environmental Science & Technology ranked forth with 219 articles (7.8%). The percentage of the top productive journal was over 50% and the rest journal occupied 43%, which indicates the focus of article distributions as well as the broad interest in pharmaceutical wastewater treatment from various research angles. A journal's relative importance was evaluated by the impact factor, especially when compared to others in the same field . Water Research ranked on top in the category of water resources with an impact factor of 4.865. It was also the most productive journal in biosorption technology for water treatment  and drinking water research . Environmental Science & Technology ranked the forth in environmental engineering with the highest impact factor of 5.228. The top productive journals in pharmaceutical wastewater treatment field had high impact factors which indicated the importance of the study of pharmaceutical wastewater treatment. Table 1: The 10 most productive journals with the number of articles, impact factor (1990-2013). To learn the contributions of different countries to the study of pharmaceutical wastewater treatment, the publications issued in the top 4 productive journals by different countries were analyzed (Figure 2). United State of American (USA) ranked the first in the journal of Water Research, Chemosphere and Environmental Sciences & Technology, and the third in the journal of Water Science & Technology. The percentage of articles published by USA to the total publications of the four journals ranged from 20.4%-38.3%. Obviously, USA played an important role in the research field of pharmaceutical wastewater treatment. Germany ranked the first in the journal of Water Science & Technology, the second in the journal of Chemosphere, the third in the journals of Water Research and Environmental Science & Technology. The percentage of articles published by Germany in the total publications of the four journals ranged from 15.7%-19.5%. Thus, Germany made a good contribution to the research of pharmaceutical wastewater treatment. For China, it ranked the fifth in the journals of Water Research, Water Science & Technology and Environmental Science & Technology, the forth in the journal of Chemosphere. The percentage of articles published by China to the total publications of the four journals ranged from 6.0%-10.6%. Considering China has been the largest raw medicine export country and the large quantity of recalcitrant pharmaceutical wastewater, more efforts should be put into the research of pharmaceutical wastewater treatment. Figure 2: The publications of different country in journals (a) Water Research, (b) Chemosphere, (c) Water Science & Technology, (d) Environmental Science & Technology; USA: United states of American, CHN: China, ESP: Spain, GER: Germany, CAN: Canada, SUI: Switzerland, UK: United kingdom, FRA: France, IN: India, AUS: Australia, NL: Netherlands, JP: Japan, DK: Denmark, ROK:South Korea. To further evaluate the research level of different countries in the research field of pharmaceutical wastewater treatment, the publication and citation index were analyzed in Figure 3. In this field, the countries with high publications included USA, China, Spain, Germany, Canada and Switzerland. Although the articles published by China ranked the second, the citation index of China was 12 per article. The citation index of developed countries including USA, Spain, Germany, Canada and Switzerland ranged from 22-48 per article, which was much higher than that of China. It is necessary to improve the research quality of China in the field of pharmaceutical wastewater treatment. The detail analysis of development of different countries in the field of pharmaceutical wastewater treatment is shown in Table 2. The publication of USA ranked number one whatever the total output or output of every year. In addition, the publication of USA increased greatly after 2004. USA was the most active country in the field of pharmaceutical wastewater treatment research which was matched with his situation of pharmacy production. The publication trends of Germany, Spain and Canada were similar to USA. China had been the second largest country regarding on the publication of pharmaceutical wastewater treatment after 2009. Since then, China has been the largest crude drug output country in the world. In this situation, Chinese researchers tried to find efficiency methods to treat recalcitrant pharmaceutical wastewater. Thus, pharmaceutical wastewater treatment has been one of the research hot spot in China. Table 2: The changes of published article numbers of main countries in the world during 1990-2013*. Figure 3: The publication and citation index of different countries. Pharmaceutical industry consumes lot amounts of raw materials. The characteristics of wastewater produced during the production process listed as follows: high concentration, extreme pH value (some water lower than 1, some water higher than 13), high salinity, fluctuant water quantity . Thus, pharmaceutical wastewater was quite a recalcitrant wastewater to be treated by biological system. To improve the biodegradability of pharmaceutical wastewater, the physical-chemical treatment was applied. The physical-chemical treatment included extraction, adsorption, coagulation, ozone oxidation, Fenton oxidation, membrane filtration, catalytic oxidation [14,62]. The biological treatment included aerobic and anaerobic treatment [23,24,26,27,30,32,33]. The title, author keywords, and KeyWords Plus containing extraction, adsorption, coagulation, ozone oxidation, Fenton oxidation, membrane filtration, catalyst oxidation and biological treatment were analyzed in the publications related to pharmaceutical wastewater treatment field. The result was shown in Figure 4. 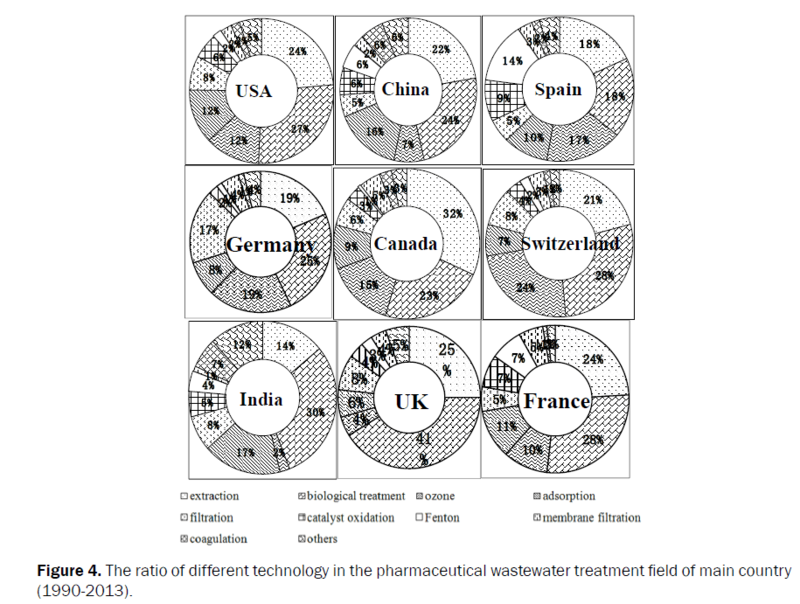 Figure 4: The ratio of different technology in the pharmaceutical wastewater treatment field of main country (1990-2013). The physical-chemical technology accounted for 53.6% to 77.7% of all the technologies in the analyzed countries. The percentage of physical-chemical technology studied by China is 69.6%, which is similar to 68.0% of USA, 70.5% of France, 70.1% of Swiss. This result indicated the physical-chemical technologies were mainstream technologies in pharmaceutical wastewater treatment. Since pharmaceutical wastewater was a kind of recalcitrant wastewater, it needed to be pretreated by physical-chemical technology to improve the biodegradability of wastewater or recycle the substances in the wastewater to alleviate the loading of wastewater treatment. Of all the physical-chemical technologies, extraction was the most popular technology in all the countries with a percentage of extraction to all technology of 14.0% -31.8%. Ozone technology accounted for more than 10% in the developed countries such as USA, Spain, Germany, France (except for UK, 4%). While it occupied less than 10% in developing countries such as China and India. This may be attributed to the high cost of ozone technology. On the contrary, adsorption technology had high percentage of all technologies, such as China of 16%, India of 18%. Most pharmaceutical wastewater would be treated by biological technology after physical-chemical technology. Thus biological technology was mainstream technology in pharmaceutical wastewater treatment, accounting for 18.0% to 41.1% of all technologies. For different countries, the mainstream technologies were different. In USA, the biological treatment, extraction, ozone, and adsorption ranked the first (27%), second (24%), third (12%), respectively. In China, the biological treatment, extraction, adsorption and ozone, ranked the first (24%), second (22%), third (16%), forth (12%), respectively. In Canada, the extraction, biological treatment, ozone and adsorption, ranked the first (32%), second (24%), third (15%), forth (10%), respectively. For UK, the biological treatment, extraction, adsorption and ozone, ranked the first (41%), second (25%), third (6%), forth (4%), respectively. The technology selection was related with wastewater quality. After 1990s, the raw medicine production was moved from developed countries to developing countries. China has been the largest raw medicine export country till now. Because of the heavy pollution and recalcitrant of wastewater during raw medicine production, it was necessary for China to study AOP technology. For UK, AOP was a minor part of all the technology. A comparison of the research in the pharmaceutical wastewater treatment field between China and worldwide was presented with the information related to annual publications, categories, journals, research emphases and tendencies. The study of pharmaceutical wastewater treatment increased sharply during 1990–2013. Many studies in the categories of environmental engineering, environmental sciences, water resource, and applied microbiology and biotechnology have been considered for comparison of the state of China and worldwide in the field of pharmaceutical wastewater treatment. Water Research, Chemosphere, Water Science and Technology, Environmental Science & Technology, and Science of the Total Environment were the five most productive journals in pharmaceutical wastewater treatment research. In the articles publishing, the USA took a leading position in the world, followed by China, Spain and Germany. However, the citation index of China was much lower than Germany, Swiss, UK and USA. The physical-chemical technologies such as extraction, adsorption, ozonation, and filtration and biological technology were research hot topics in the field of pharmaceutical wastewater treatment. This work was financial supported by the National Key Scientific and Technological Project for Water Pollution Control and Management (2012ZX07202-002), State Environmental Protection Key Laboratory of Microorganism Application and Risk Control (No. MARC 2012D008). Uslu MO et al. (2013) A survey of occurrence and risk assessment of pharmaceutical substances in the Great Lakes Basin. Ozone SciEngin 35: 249-262. Li YF et al. (2014) A review on removing pharmaceutical contaminants from wastewater by constructed wetlands: Design, performance and mechanism. Sci Total Environ 468–469: 908–932. Loganathan B et al. (2009) Contamination profiles and mass loadings of macrolide antibiotics and illicit drugs from a small urban wastewater treatment plant. Chemosphere. 75: 70–77. Qiu GL (2011) Berberine pharmaceutical wastewater treatment using hybrid UASB-MBR process and the mechanisms. Ph. D thesis, Beijing Normal University. Yang Y et al. (2011) Occurrence and phase distribution of selected pharmaceuticals in the Yangtze Estuary and its coastal zone. J Hazard Mater 190: 588-596. Verlicchi P et al. (2012) Occurrence of pharmaceutical compounds in urban wastewater: removal, mass load and environmental risk after a secondary treatment-a review. Sci Total Environ 429: 123-155. Jiang JQ et al. (2013) Occurrence, transportation, monitoring and treatment of emerging micro-pollutants in waste water-a review from global views. Microchem J 110: 292–300. Richardson SD (2007) Water analysis: emerging contaminants and current issues. Analy Chem 79: 4295-4323. Kostich M and Lazorchak J (2008) Risks to aquatic organisms posed by human pharmaceutical use. Sci Total Environ 389: 329–339. Pal A et al. (2010) Impacts of emerging organic contaminants on freshwater resources: review of recent occurrences, sources, fate and effects. Sci Total Environ 408: 6062–6069. Liu JL and Wong MH (2013) Pharmaceuticals and personal care products (PPCPs): A review on environmental contamination in China. Environ Intern 59: 208-224. Zhang J et al. (2013) Removal of cytostatic drugs from aquatic environment: a review. Sci Total Environ 445-446: 281-298. Mestre AS et al. (2009) Waste-derived activated carbons for removal of ibuprofen from solution: role of surface chemistry and pore structure. BioresTechnol 100: 1720-1726. Naddeo V et al. (2009) Degradation of diclofenac during sonolysis, ozonation and their simultaneous application. Ultrasonic Sonochem 16: 790-794. Rossner A et al. (2009) Removal of emerging contaminants of concern by alternative adsorbents. Water Res 43: 3787-3796. Klamerth N et al. (2010) Degradation of fifteen emerging contaminants at µg L-1 initial concentrations by mild solar photo-Fenton in MWTP effluents. Water Res 44: 545-554. Martínez F et al. (2013) Coupling membrane separation and photocatalytic oxidation processes for the degradation of pharmaceutical pollutants. Water Res 47: 5647-5658. Molinos-Senante Met al. (2013) Economic valuation of environmental benefits of removing pharmaceutical and personal care products from WWTP effluents by ozonation. Sci Total Environ 461-462: 409-415. Mohan SV et al. (2001) Biotreatability studies of pharmaceutical wastewater using an anaerobic suspended film contact reactor. Water SciTechnol 43, 271-276. Enright AM et al. (2005) Low temperature anaerobic biological treatment of solvent-containing pharmaceutical wastewater. Water Res 39: 4587-4596. Batt AL et al. (2006) Enhanced biodegradation of iopromide and trimethoprim in nitrifying activated sludge. Environ SciTechnol 40: 7367-7373. Chelliapan S et al. (2006) Performance of an upflow anaerobic stage reactor (UASR) in the treatment of pharmaceutical wastewater containing macrolide antibiotics. Water Res 40: 507-516. Joss A et al. (2006) Biological degradation of pharmaceuticals in municipal wastewater treatment, proposing a classification scheme. Water Res 40: 1686-1696. Lindberg RH et al. (2006) Behavior of Fluoroquinolones and trimethoprim during mechanical, chemical, and active sludge treatment of sewage water and digestion of sludge. Environ SciTechnol 40: 1042-1048. Han WQ et al. (2008) Treatment of bactericide wastewater by combined process chemical coagulation, electrochemical oxidation and membrane bioreactor. J Hazard Mater151: 306-315. Gonzalez O et al. (2009) Performance of a Sequencing Batch Biofilm Reactor for the treatment of pre-oxidized sulfamethoxazole solutions. Water Res 43: 2149-2158. Prado, N et al. (2009) Biodegradation and biosorption of tetracycline and tylosin antibiotics in activated sludge system. ProcBiochem 44: 1302-1306. Sreekanth D et al. (2009) Thermophilic treatment of bulk drug pharmaceutical industrial wastewaters by using hybrid up flow anaerobic sludge blanket reactor. BioresTechnol 100: 2534–2539. Shariati FP (2010) Membrane bioreactor for treatment of pharmaceutical wastewater containing acetaminophen. Desalination 250: 798–800. Tambosi JL et al. (2010) Removal of pharmaceutical compounds in membrane bioreactors (MBR) applying submerged membranes. Desalination 261: 148-156. Clara M et al. (2005) Removal of selected pharmaceuticals, fragrances and endocrine disrupting compounds in a membrane bioreactor and conventional wastewater treatment plants. Water Res 39: 4797–4807. Badawy MI et al. (2009) Fenton-biological treatment processes for the removal of some pharmaceuticals from industrial wastewater. J Hazard Mater 167: 567-574. Sirtori C et al. (2009) Solar Photo-Fenton as finishing step for biological treatment of a pharmaceutical wastewater. Environ SciTechnol 43: 1185-1191. Yu TH et al. (2009) Removal of antibiotics and non–steroidal anti–inflammatory drugs by extended sludge age biological process. Chemosphere. 77: 175-181. Sipma J et al. (2010) Comparison of removal of pharmaceuticals in MBR and activated sludge systems. Desalination. 250: 653-659. Trinh T et al. (2012) Removal of trace organic chemical contaminants by a membrane bioreactor. Water SciTechnol 66: 1856-1863. Boxall AB A et al. (2003) Are veterinary medicines causing environmental risks? Environ SciTechnol 37: 286-294. Enick V and Moore MM (2007) Assessing the assessments, pharmaceuticals in the environment. Environ Impact Assess Review 27: 707-729. Ince KB et al. (2002) Effect of a chemical synthesis based pharmaceutical wastewater performance, acetoclasticmethanogenic activity and microbial population in an upflow anaerobic filter. J ChemTechnol Biotech 77: 711-719. Oz AN et al. (2002) Microbial population dynamics in an anaerobic CSTR treating chemical synthesis based pharmaceutical wastewater. J Environ Sci Health 38: 2029-2042. Moiseev IK et al. (1976) Synthesis of amantadine via the nitrate of 1-adamantanol. Pharm Chem J 10: 450-451. Ho, YS et al. (2010) Japanese lung cancer research trends and performance in Science Citation Index. Internal Medic 49: 2219-2228. Chen YS et al. (2013) Patents and market value in the US pharmaceutical industry: new evidence from panel threshold regression. Scientometrics, 97(2), 161-176. Ding ZQ et al. (2013) Bibliometrics evaluation of research performance in pharmacology/pharmacy: China relative to ten representative countries. Scientometrics 96:829-844. Plotnikova T and Rake B (2014) Collaboration in pharmaceutical research: exploration of country-level determinants. Scientometrics 98: 1173-1202. Hirsch JE (2005) An index to quantify an individual's scientific research output. Proceedings of National Academy of Sciences of United States of American. 102: 16569-16572. Falagas ME et al. (2006) A bibliometric analysis of global trends of research productivity in tropical medicine. ActaTropica 99: 155-159. Calero C et al. (2007) Research cooperation within the bio-pharmaceutical industry: Network analyses of co-publications within and between firms. Scientometrics 71: 87-99. Chiu WT and Ho YS (2005) Bibliometric analysis of homeopathy research during the period of 1991 to 2003. Scientometrics. 63: 3-23. Ho YS (2007) Bibliometric analysis of adsorption technology in environmental science. J Environ Protect Sci 1: 1-11. Ho YS (2008) Bibliometric analysis of biosorption technology in water treatment research from 1991 to 2004. Intern J Environ Pollut 34: 1-13. Ho YS (2013) Mapping of drinking water research: A bibliometric analysis of research output during 1992-2011. Sci Total Environ 443: 757-765. Tang X et al. (2013) Development trend of research on water resources in international rivers based on bibliometric. J Water Res Water Engin 24: 124-128. Chen YS and Chang KC (2010) Analyzing the nonlinear effects of firm size, profitability, and employee productivity on patent citations of the US pharmaceutical companies by using artificial neural network. Scientometrics 82: 75-82. Messinis G (2011) Triadic citations, country biases and patent value: the case of pharmaceuticals. Scientometrics 89: 813-833. Ho YS et al. (2010) Japanese lung cancer research trends and performance in Science Citation Index. Internal Medic 49: 2219-2228. Mao N et al. (2010) Abibliometric study of the trend in articles related to risk assessment published in Science Citation Index. Human Ecolog Risk Assess 16: 801-824. Benavent RA et al. (2004) Impact factor of the Spanish medical journals. Medic Clin 123: 697-701. Singh KP et al. (2008) Liquid-phase adsorption of phenols using activated carbons derived from agricultural waste material. J Hazard Mater. 150: 626-641.